There's nothing quite like watching a film with your SO! But there are times when the films you want to watch have been pulled out of commercial theaters or you just want a change of scene, right? This microcinema, which was founded in 2017, can only fit up to 65 people. You can even borrow blankets and pillows from the counter! Another ~tiny~ theater, Black Maria was once a final screening room of SQ Film Productions in the '70s! ALSO, this theater allows alcohol inside! It has been screening local and independent films since October 2017 and can seat 40 people. The popular cinema in San Juan now has another branch in Anonas! 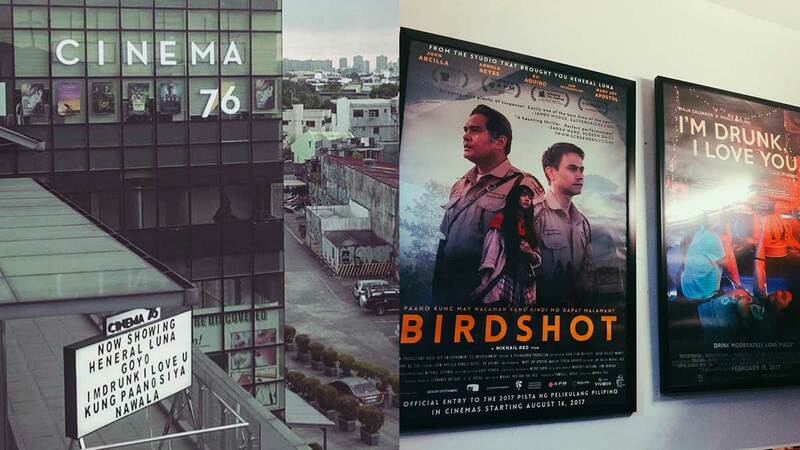 The founders of Cinema '76 are also the people behind TBA Studios (which produced Heneral Luna and I'm Drunk, I Love You). Where you can find it: 160 Luna Mencias St. Addition Hills, San Juan City and 3rd Floor Anonas LRT City Center, Aurora Blvd. Bagumbuhay, Quezon City. This place is free from film censorship! Though not exactly intimate (it can seat up to 800 people), the UP Cine Adarna regularly holds screening of local and international independent films followed by talks with its actors and directors. Guys, this theater has a film museum! It's run by the Film Development Council of the Philippines (FDCP) and has a cafe (filled with film posters, of course), a souvenir shop, and ever-changing exhibits.